What Can We Do About Donald Trump's Unsecured Smartphone? As recently as yesterday, President Trump sent a tweet using his old, unsecured Android phone. This happened just three days after Congressman Ted Lieu and 14 other House Democrats sent a letter to the Oversight Committee demanding an investigation into this blatantly bad security practice. Everybody agrees that it’s really, really stupid. But can Congress really force Trump to ditch the dangerous tweet machine? Unfortunately, no. Can the Secret Service make him stop? Nah. What about the FBI or the intelligence community or a really well-worded petition? Not a chance. 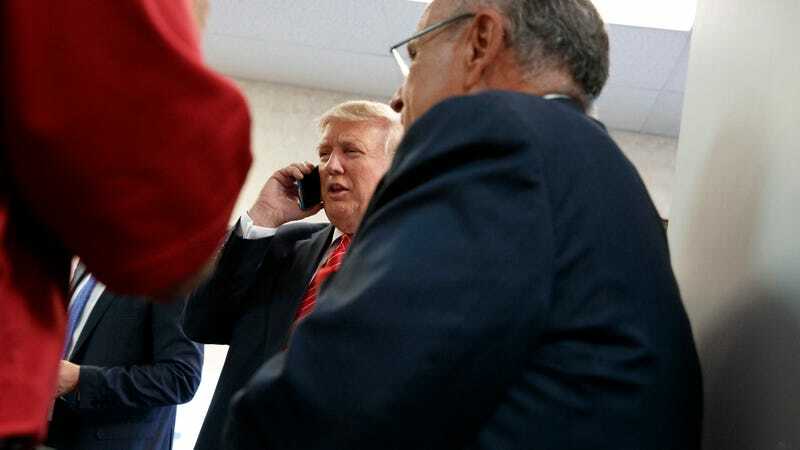 President Trump can keep using his vulnerable phone, which is reportedly an old Samsung Galaxy S3, until President Trump decides to do something different. Congressman Lieu told Gizmodo that his investigation would force certain officials to testify before Congress about the president’s security practices, and the committee could then publish a report that would “hopefully put pressure on the White House to change its ways.” Congress, however, cannot force the president’s hand. The behavior is actually stupid for a few reasons. At a very basic level, it raises the risk that hackers could take over Trump’s Twitter account and send potentially fake or frightening messages to its 25.4 million followers. Some argue that the president’s tweets already jeopardize national security, but the idea that a foreign actor could use the account for malicious ends is certainly scarier. It’s unclear if Trump truly understood how stupid this was from a security perspective. Then again, as president, Trump’s basically allowed to decide what kinds of security measures are appropriate at any given time. Cory Louie, the White House’s former chief information security officer, used to watch over the president’s cybersecurity concerns, but “left” his job a couple weeks ago. Without anyone to answer to, there’s nothing that security experts or the American people can do about Trump’s slapdash approach to sensitive information. Goldman went on to compare Trump’s refusal to use a secure phone to Trump’s refusal to release his tax returns. Obviously, President Trump is happy to buck protocol until somebody that he listens to tells him to stop. It’s unclear who might be able to talk him out of his dangerous Twitter habit. Looking ahead, we all need to realize that this cybersecurity problem isn’t going away. The intelligence community agrees that Russian hackers broke into the DNC in an attempt to influence the election. Who’s to say Putin’s cyber army will stand down now? Trump doesn’t have much experience with national security or computers. But the good news is that plenty of people in the government do. Let’s just hope they can talk the White House into being more careful.